Keith enjoys writing and has been published in several local and national periodicals, and has been a featured financial expert on FOX 9 (KMSP-TV) sharing his insights on personal finances for today's families and individuals. Estate & Business Planning Specialist, Keith Moeller, showcases how a balanced approach of giving throughout life, as well as at death, may help a family create their desired legacy while reducing the impact of taxes. Estate and Business Planning Specialist, Keith Moeller, was featured in Minneapolis/St. Paul Business Journal's February 27th issue. Keith serves as a panelist, exploring topics about the wealth management and planning landscape. Estate and Business Planning Specialist, Keith Moeller, was featured in an article that ran in the December 26, 2014 issue of the Wall Street Journal. The article tells the story of a retired couple turning to their advisor, Keith, to help plan their estate and the next stages of their lives. Keith presents a compelling case for how Northwestern Mutual's financial advisors can help small business owners take better control of their retirement plans. It recounts the planning process through which Keith helped two of his clients successfully transfer their business to a longtime employee and retire on their terms. 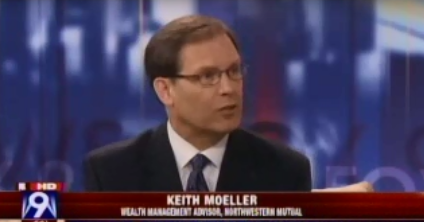 Wealth Management Advisor at Northwestern Mutual, Keith Moeller, was featured in the Star Tribune in December, 2012. Keith highlights three key principles that make financial planning easier and more effective. If you'd like to receive a copy of this article, please email Keith at keith.moeller@nm.com. Many people look forward to exploring the world once they retire. But who would have guessed that travel can also be a game changer when it comes to healthier aging? Read the article.